The charges are in addition to 28 front-line officers slated to have disciplinary hearings for a range of misconduct offences, including unlawful arrests and use of excessive or unnecessary force against prisoners. The details of charges come on the heels of a report released Wednesday by Ontario's top civilian complaints watchdog Gerry McNeilly, head of the Office of the Independent Police Review Director. 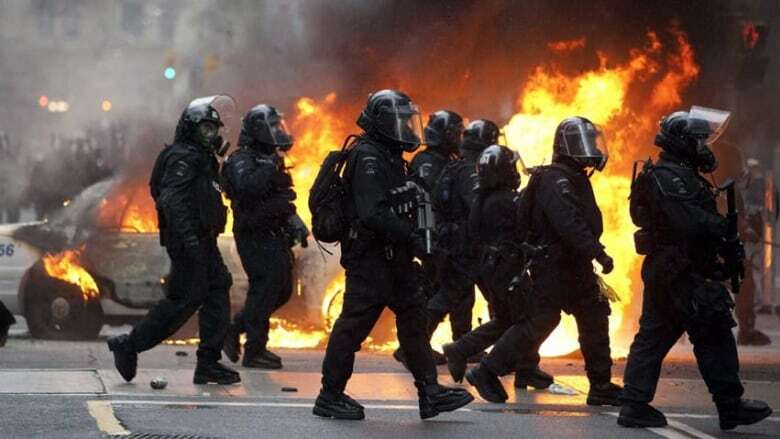 He concluded in a "systemic review" of the G20 in Toronto that police leaders were poorly prepared and launched a crackdown that led to illegal mass arrests, arbitrary searches and unlawful detentions of more than 1,000 largely peaceful protesters and bystanders. "Mr. McNeilly is recommending charges to be laid against about a half-dozen senior officers," confirmed Toronto Police Services board chair Alok Mukherjee in an interview with CBC News on Thursday. Mukherjee said those who face misconduct hearings include "people who were in decision-making roles … that go pretty high in the organization. He has identified some people who are at very senior ranks." Toronto’s police union this week was in an Ontario court attempting to have all G20 disciplinary charges against officers thrown out due to lengthy delays. But a panel of Ontario Divisional Court judges ruled against the union, clearing the way for disciplinary hearings to proceed in the coming months against 28 officers that could result in exonerations or punishments ranging from docking of officers' pay to outright dismissal. Const. Vincent Wong Unlawful arrest of "J.W." (Sunday, June 27, 10 a.m. at Yonge Street and Gerrard Street). Const. Blair Begbie Unlawful arrest of "J.W." (June 27, 10 a.m. at Yonge Street and Gerrard Street). Const. Alan Li Unlawful arrest of "A.S." (June 27, 4 p.m., Bloor Street West and Huron Street). Const. Donald Stratton Unlawful arrest of "A.S." (June 27, Bloor Street West and Huron Street). Const. Michael Kirpoff Unnecessary force on prisoner "J.M." (June 27, Queen Street West and Spadina Avenue). Const. Ryan Simpson Unlawful arrest of cyclist "N.W." (June 27, Bloor Street and Spadina Avenue). Const. Jason Crawford Unlawful arrest of "N.W." (June 27). Const. Michael Martinez Unnecessary force on prisoner "J.R." (Saturday, June 26, Novotel Hotel). As a result of the disciplinary hearing, the officers could face penalties ranging from docked pay to dismissal. The officers could also be exonerated. Toronto police spokesman Kevin Masterman told CBC News all of the officers facing misconduct charges remain on the job and are not suspended. Constables Begbie and Wong will appear before a hearing on July 24. The rest of the officers have a hearing scheduled for July 19.